Aguateca is a Classic Mayan site located in the Petexbatun region of Guatemala. In this volume, Takeshi Inomata, Daniela Triadan, and their team examine the life of the Mayan royal family, nobles, and their retainers through the analysis of numerous complete and reconstructible artifacts left in this site’s elite residential area. Aguateca was unexpectedly attacked around AD 810, its central part was burned and its residents fled or were taken captive. Because of the surprise nature of the attack, most artifacts were left in their original locations, providing unprecedented views of the daily life of the Classic Maya. Detailed analyses of these objects and their distribution has shown that Mayan elites stored some of their food in their residences and that they also conducted various administrative duties there. The presence of numerous precious ornaments indicates that many of the Maya elite were also skilled craft producers. 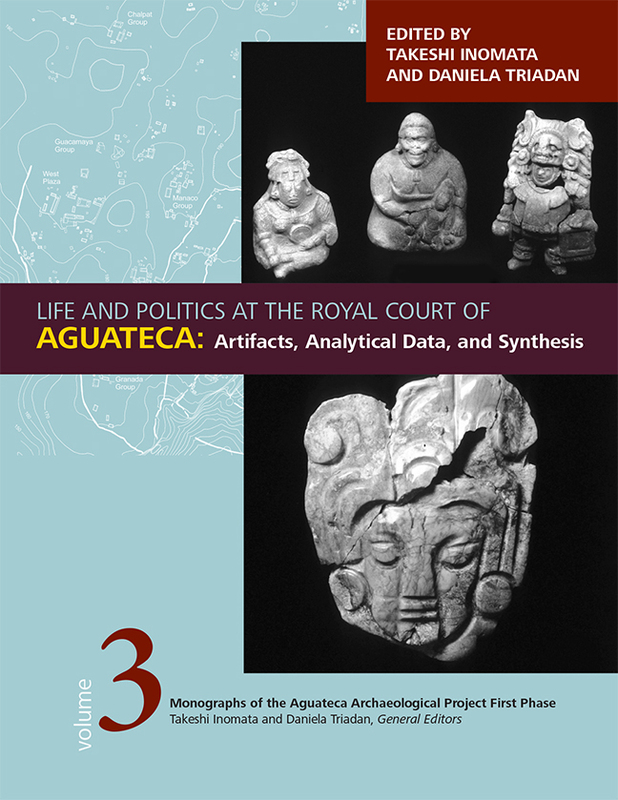 Life and Politics at the Royal Court of Aguateca is the third and final volume of the monograph series on Aguateca. It presents the analyses of items not covered in the first two volumes, including figurines, ceramic laminates and masks, spindle whorls, ground stone, and bone artifacts, as well as hieroglyphic texts and plant and animal remains. It discusses the broad implications of this remarkable data set and provides a summation of the project. Takeshi Inomata is director of the Aguateca Archaeological Project and associate professor of anthropology at the University of Arizona. Daniela Triadan is codirector of the Aguateca Archaeological Project and associate professor of anthropology at the University of Arizona. She is also a research assistant with the Smithsonian Institute.